We are so stoked to release WHITEWASHED GRAVES, out now on Folk Til You Punk Records! Grab a copy here, and jump on our Facebook to find out where we are playing next. Can’t wait to have a beer and celebrate with you all! Foreign Soil – Official Video! Foreign Soil – OUT NOW! Hope you like it. More stuff still to come. New EP – Coming soon! RSA have been busy in the studio recording the next EP (with the odd drink or two), which will be released later in 2016! Stay tuned…. If you want to keep up to date with the adventures of the RSA, you can find them in the usual haunts! The crew here are getting super excited as they get ready to jump on an airplane, and not know when they’ll be home again (well kind of). It’s been a couple of years since RSA first headed to the US playing with the likes of Dropkick Murphy’s and Frank Turner. This time they return playing Cali’s favourite Irish festival Get Shamrocked, playing with the likes of Flatfoot 56, Brick Top Blaggers and Whiskey and the Damned. After that they join Chicago heros, The Tossers for their Halfway to St Patricks Tour, plus heaps of extra dates all over. Check out when they’ll be in a town near you below! Hello from us, can you believe it’s already 2015, and JUNE! It’s been quite a busy time in camp RSA with writing new tunes, playing with new recruits and organising new tours and shows coming out the wazzoo. Firstly, but not so recently our beloved drummer Adge, who has been with us since the beginning and before (literally) decided to take a new turn in life a return to study. We wish him all the best, and not to fret he won’t be a stranger. We look forward to him getting up from time to time again for old times sake. You might even see him at the merch desk when we force him. But we are super stoked to have another Rogers join us, but on the skins this time. Chad will be taking over the drumming reigns from Adge. He’s already a few shows in so make sure you come down to the next one to see him in action. If you haven’t already heard an update in RSA world. Ladies and gentlemen, we’d like to introduce our newest band member and new man manhandling the bass – Mr JAMES ROGERS. Those around the punk scene in Melbourne (and the rest of the world) may know James as the bass player for Kat’s other Celt folk punk band Catgut Mary who are themselves a favorite of US and European Celt Punk Radio, since their split with THE MAHONES a few years ago. James is a rad dude who is fitting straight into the RSA and will be joining us for the show for Naf this Sunday arvo. Andy Area-7 will still fill in as a last stint at The Corner Hotel, as Catgut will themselves be across town playing with Melbourne’s OTHER folk/punks the mighty Mutiny, Melbourne. Join us in raising a glass to James, while we reload and get back to what we love… writing, touring and doing this harder than ever. $12 for 5 bands and a night of guaranteed party. 300 pressed, sea blue/oxblood colored vinyl. Includes immediate download of 12-track album in the high-quality format of your choice (MP3, FLAC, and more), plus unlimited mobile access using the free Bandcamp listening app. 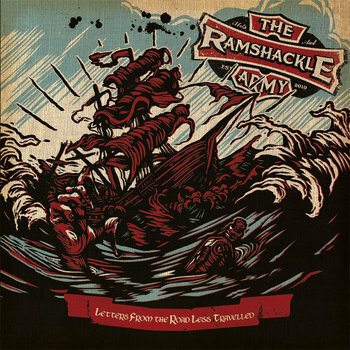 Melbourne Celt folk-punks THE RAMSHACKLE ARMY broke onto their local scene in 2010 and quickly set about playing to diverse crowds up and down the East Coast of Australia, finding themselves equally at home in front of a festival crowd as the dark seedy punk rock shows that they knew and loved. Setting out to create party music they combined Aussie folklore with personal experience, while drawing inspiration from the sounds of Australian and Celtic folk, with a heavy dose of the punk rock which they had grown up on. Spos New Year’s Eve is that bit of the year where everyone thinks about what they did (and didn’t) get done in the past twelve months, and what they reckon they’re gonna get done in the next twelve. 2012 was without a doubt our most interesting and successful year yet. After we got invited to play with Dropkick Murphys in Melbourne (dream made, pants wet etc) the dudes ended up taking us back to the US of A for their East Coast tour where we hung out with Frank Turner (and played some other shows with him). Then we ended up being the first Celt punk band to play CherryRock12 in legendary AC/DC Lane and supported Anti-Flag, Strike Anywhere and The Flatliners. Played Drunken Moon Festival with Brothers Grim, Gay Paris, Jackson Firebird, Howling Steam Train and Kira Piru & The Bruise; toured Brisbane and Sydney a couple of times and finished the whole shemozzle with an epic New Years Eve party for Black Cherry in Sin City – playing with champions Area-7 and Barbariön. No time for snoozin’ though. The tour calendar for 2013 is shaping up to be a beauty and there are new recordings and a big fat Celt album coming out as well. Stay tuned, cats! Not something we normally do, but lotsa mid-week shows coming up! Going acoustic at Old Bar tomorrow night for James Grim's sweet art exhibition opening, and then Bombay Rock on Wednesday!